Home / Product / Red Chile Bars (homemade) sold by the pair. Red Chile Bars (homemade) sold by the pair. 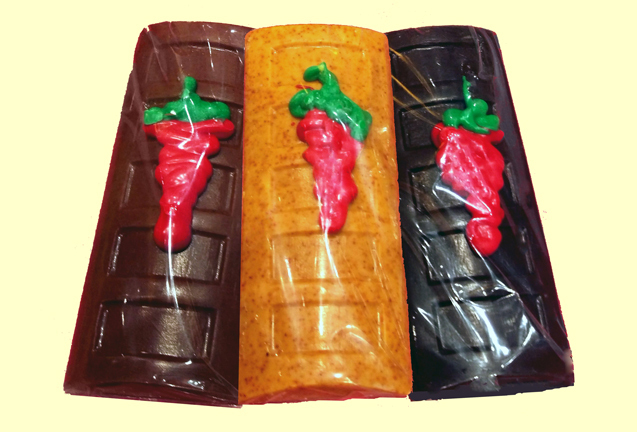 Red Chile Bars are perfect combinations of Red Chile and chocolate. These just great snacks or starting points for your own personal projects or baking applications. Our white, milk, and dark chocolate is a delicious, smooth and creamy with just a bit of spice. It is easy to melt and requires no tempering. Normally each bar is individually wrapped. Variations in individual size, shape, color, and weight are normal. Chocolate may melt in shipping if ordering during warmer temperatures. Shipping options with an ice pack during summer months is encouraged. Do not over heat, keep moisture out of candy. Ingredients:Red Chile, White Chocolate(Sugar, Cocco butter, Nonfat Dry Milk, Milk, Soy Lecithin, and Vanilla. )Milk Chocolate (Sugar, Partially Hydrogenated Palm Kernel and Cottonseed Oils, Nonfat Dry Milk, Milk, Glyceryl Lacto Esters of Fatty Acids, Soy Lecithin, Salt, and Artificial Flavor.) Dark Chocolate(Sugar, Partially Hydrogenated Palm Kernel and Cottonseed Oils, Nonfat Dry Milk, Cocoa Processed with Alkali, Cocoa, Glyceryl Lacto Esters of Fatty Acids, Soy Lecithin, and Salt.) ALLERGENS: CONTAINS: MILK, SOY.